Alfred Salter's statue looking towards his daughter and the City of London. Photo: Jim Linwood/flickr CC. 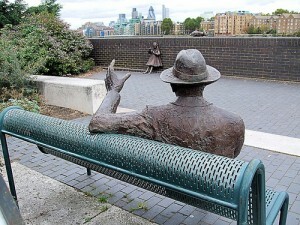 A London statue of renowned Quaker Alfred Salter from Bermondsey was stolen from its site by the River Thames this month. Southwark council has announced that it is offering a reward for information that leads to the arrest and conviction of the thieves of the statue that has been in place since 1991. Alfred Salter was a doctor who became a member of parliament. He continued to live among his constituents in a poor area of London as part of his witness to them. Councillor Richard Livingstone, cabinet member for finance, resources and community safety, said: “We are shocked that thieves have stolen the statue. The statue has been valued at £17,500. Two related statues showing Alfred Salter’s daughter and their cat have been removed by the council and placed in a secure location. Simon Hughes, MP for Bermondsey and Old Southwark, has joined in the community campaign to find the criminals who stole the statue. After taking part in a community meeting at the Mayflower pub recently, which was joined by Alfred Salter’s great niece, Simon Hughes called on the police to widen their investigation across all scrap metal businesses in London. In the government’s autumn statement it was announced that an additional £5 million has been allocated to set up a nationwide taskforce to target scrap metal thieves and scrap metal dealers who illegally trade in stolen metal. “We must all be determined that those people responsible for such huge disrespect to the memory of Dr Salter and the whole community must be tracked down if humanly possible. Anybody with any information should contact Crimestoppers on 0800 555 111, Southwark Council on 020 7525 1501 or my office on 020 7232 2557. Like Crimestoppers, I am willing to treat any information leading to the recovery of the statue as confidential. The first priority is to recover the statue. 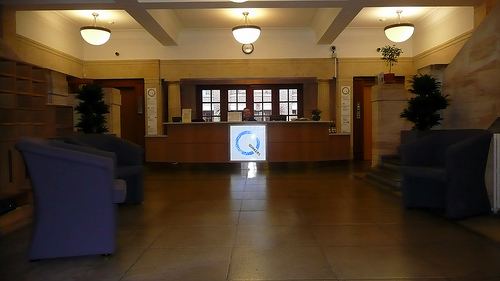 The second is to bring those responsible to justice,” said Simon Hughes. “Alfred Salter was a man of principles – a pacifist, a teetotaller, and determined to improve the lives of the poor in Bermondsey. He preached and put into practice these principles.